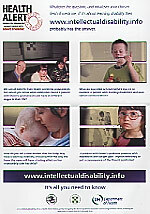 Affiliation to the Down's Syndrome Association applied for). 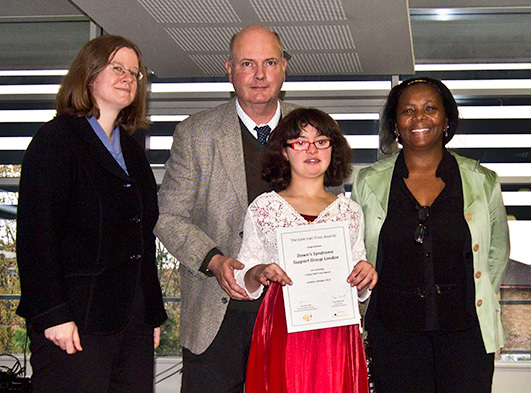 The Down's Syndrome Association London Branch was formed in June 2000 to try to meet the needs of a number of young children with Down's Syndrome and their families. Along with most other DSA branches we have now become a separate entity as requested by the DSA in 2002. This will enable us to fundraise from sponsors who do not give to branches of national charities and handle our own financial affairs. If you are interested in helping us please contact us. The London Support Group just picked up a top award. 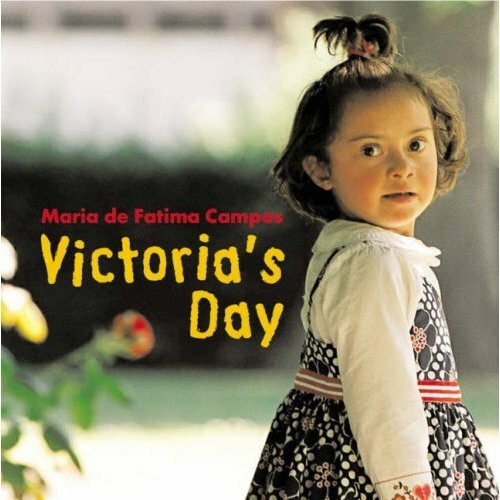 young people who have Down's syndrome. 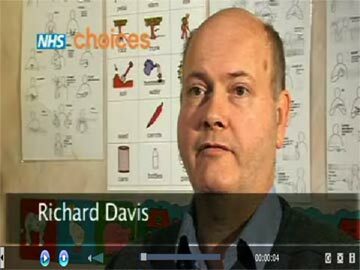 a film with Richard Davis, Hon Sec. 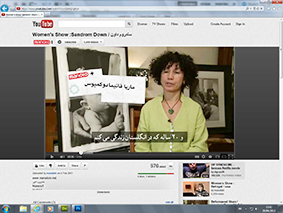 An interview with Iranian TV channel Monoto TV. after that it is all in English. "This is a beautifully presented little book which will be welcome on the shelves and coffee tables of homes and schools. A charming observation of a child who "just happens to have Down's syndrome". A useful tool to aid inclusion and promote understanding". 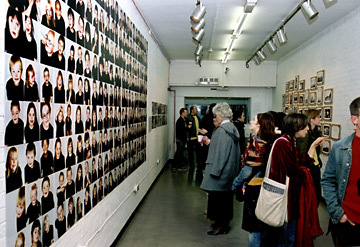 A Photography exhibition was shown at Sir John Cass Dept of Art Media & Design, London during awareness week and also at the OXO Tower Gallery, South Bank, London. The exhibition is entitled "Shifting Perspectives" and shows work by seven London photographers whose children have Down's syndrome. This work offers alternative representations of both adults and children with Down's syndrome and challenges conventional attitudes and prejudices. 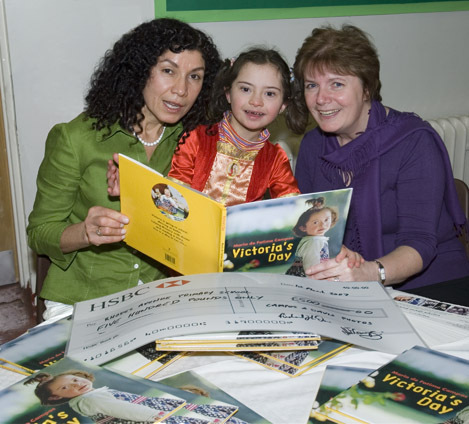 of pictures about her daughter Victoria and her first three years of life as a child who has DS. The Branch is building a database of facilities for people with Down's Syndrome that could be accessed on line. We need IT experts who can help us with this. We are also arranging for specialist Occupational Therapy to be available free at the point of service. If you would like to help us with these projects and our general work of informing new parents about Down's syndrome you can make a donation now. Thank you. This site is jointly managed by the Down's Syndrome Association and St. George's Medical School and is funded by the Department of Health and GUS Charitable Trust. 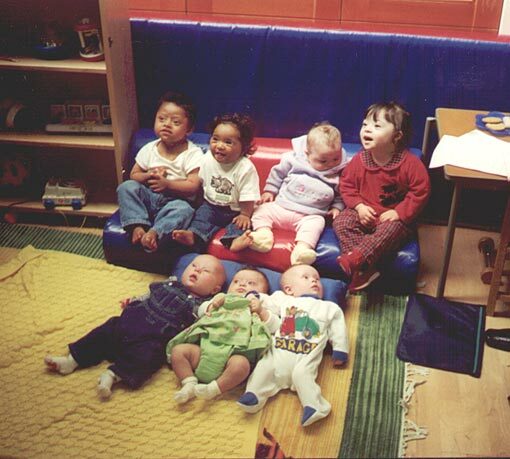 Our first members: Left to right; Darrell, Nathan, Hannah, Jennifer, Sam, Victoria and Edward.